Disclosure: This post was sponsored by McCormick as part of an Influencer Activation and all opinions expressed in my post are my own. It is FOOTBALL time! In our home that means family, food, friends and fun! I love to host themed parties and combine that with the love of football, good company and great food and you have a winning combination. 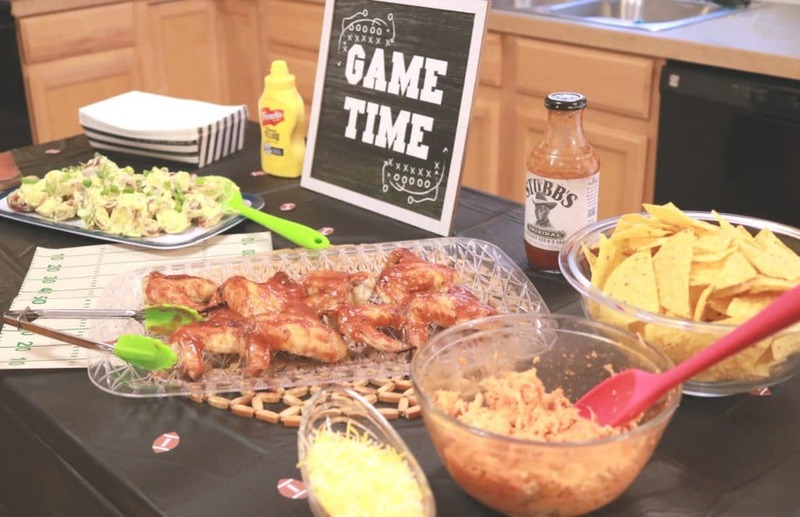 This easy and delicious homegating party set up will definitely wow your guests! This past weekend our home team brought home the win at the last 3 seconds of the game and boy was this house loud and excited! We had a couple neighbors and their kids over to watch the game and it was awesome. I set up a little easy and delicious homegating party with some very simple and super tasty recipes and everyone was really impressed. The most impressive part? The meals were quick, the set up was quicker and I was able to sit back, relax and enjoy the game and time with our friends! If that isn’t a hostess win, I do not know what is! I have some go to recipes when I am preparing to host people. There are just some things that every good football party needs, but in our house, they also need to be kid friendly! BBQ wings, potato salad and nachos are all foods that most kids will eat and most adults love too! I headed to Walmart earlier in the day and grabbed the ingredients to make those entrees. Walmart had everything that I needed to host a group of people and at the right price. I was able to feed 8 people for $29.00. That is a huge win in this pocketbook! 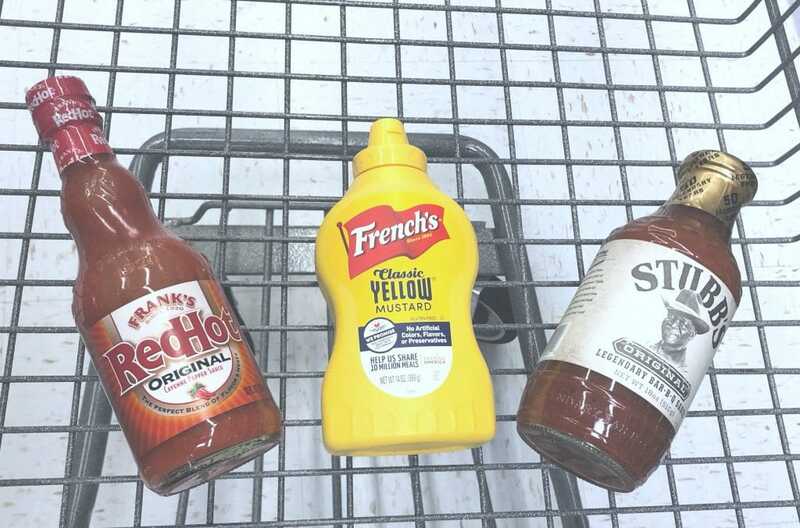 My plan to make potato salad absolutely needed French’s® Mustard and while I was there I decided to try out a new BBQ sauce that looked tasty called Stubb’s® Original Bar-B-Q Sauce. Of course I grabbed a family favorite in Frank’s® RedHot Sauce and the rest of the ingredients and got to work! My husband LOVES wings, so this is an absolutely football party must in our house. 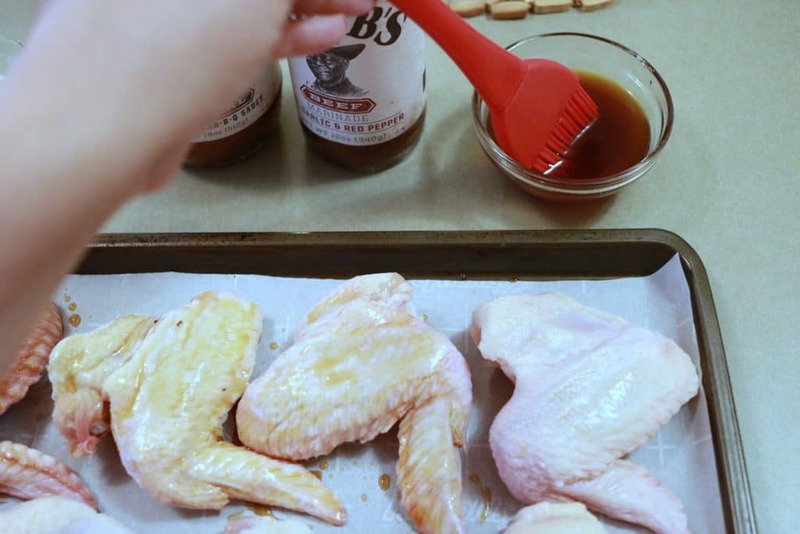 After grabbing the Stubb’s® Bar-B-Q sauce and marinades, I quickly ran to their website to see what recipes they might have for wings. 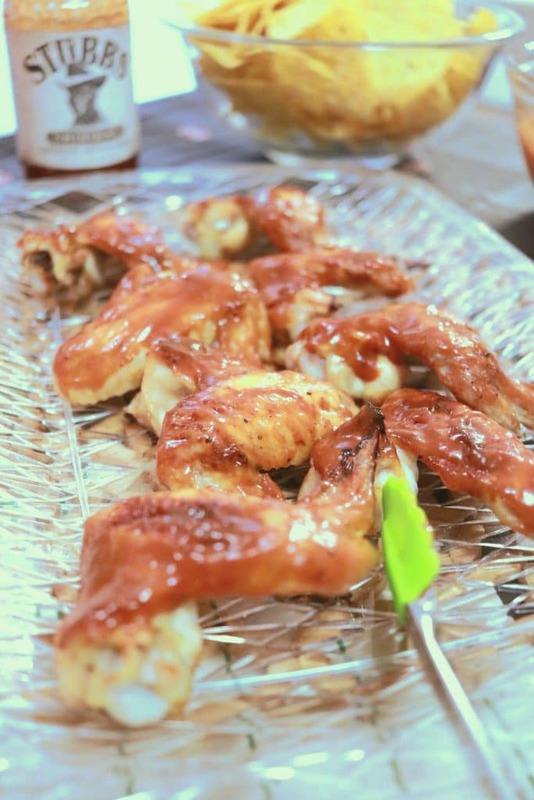 They had this awesome crispy BBQ Chicken Wing recipe that I knew was going to be a hit, so I got to work! First I prepped the chicken and prepared the marinades and melted butter. I have to admit, I grabbed the full wings at the store instead of the wing pieces, but honestly, no one even batted an eye and these delicious morsels were all gone quickly! I was very glad I made 2 servings! I coated both sides of the wings with Stubb’s® Bar-B-Q marinade and butter and then got the chicken into the oven. While the chicken was baking, I went ahead and prepared the glaze. 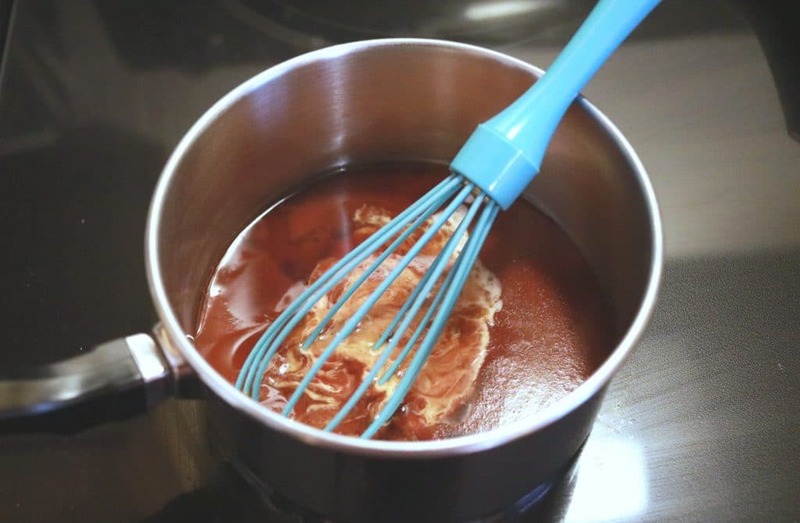 I poured the Stubb’s® Original Bar-B-Q Sauce into a saucepan, along with some more marinade, water and a little cornstarch and heated for a few moments. I then removed it from heat, removed the wings from the oven and coated those wings in this amazing glaze. The chicken came out very crispy (which honestly with baking, I was not expecting) and was cooked perfectly. 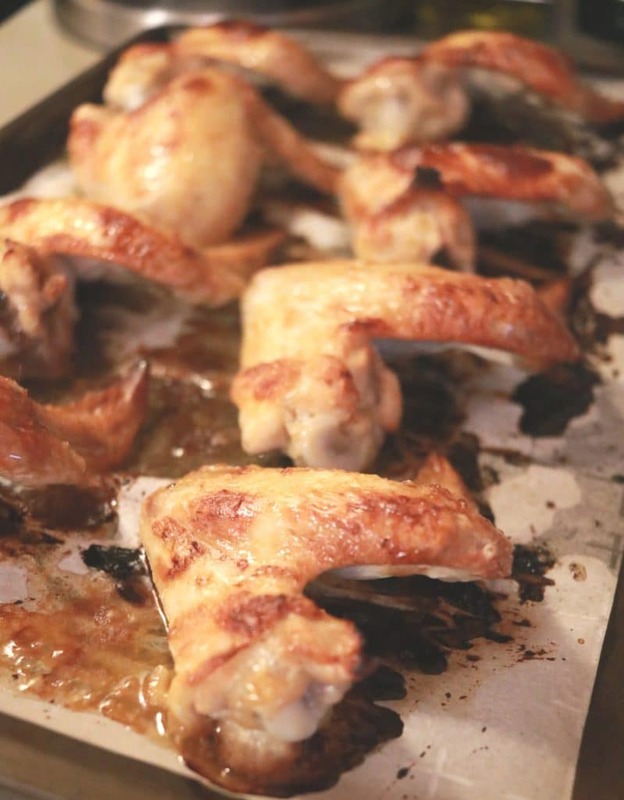 I have never had my wings look so yummy coming out of the oven, with that perfect golden shine and texture. I plated the wings on a simple tray and the hardest part of the meal was done (and in 50 minutes at that)! 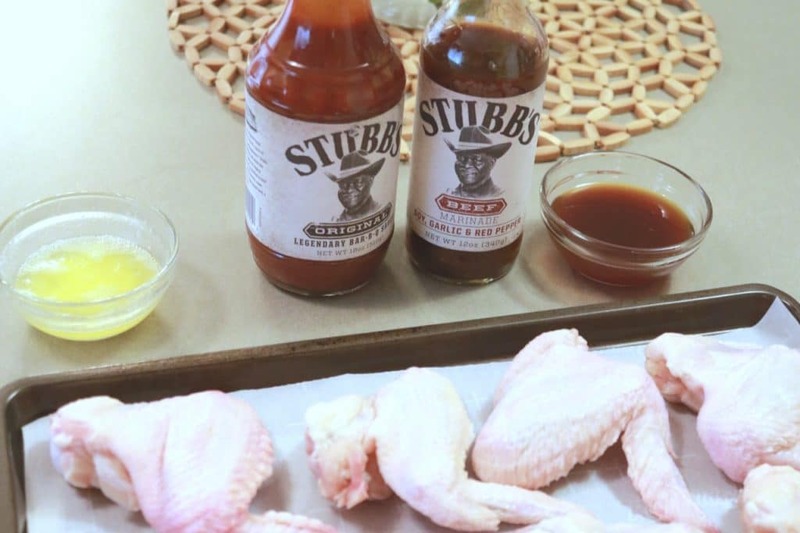 If you want to grab the recipe and directions for these yummy wings, head to the Stubb’s® Bar-B-Q website here. Definitely, bookmark it because you NEED these in your life. Of course we couldn’t just have the wings. Potato salad and nachos were also on the menu. I cooked boiled the potatoes for the Creamy & Tangy Potato Salad while I was prepping the chicken wings. 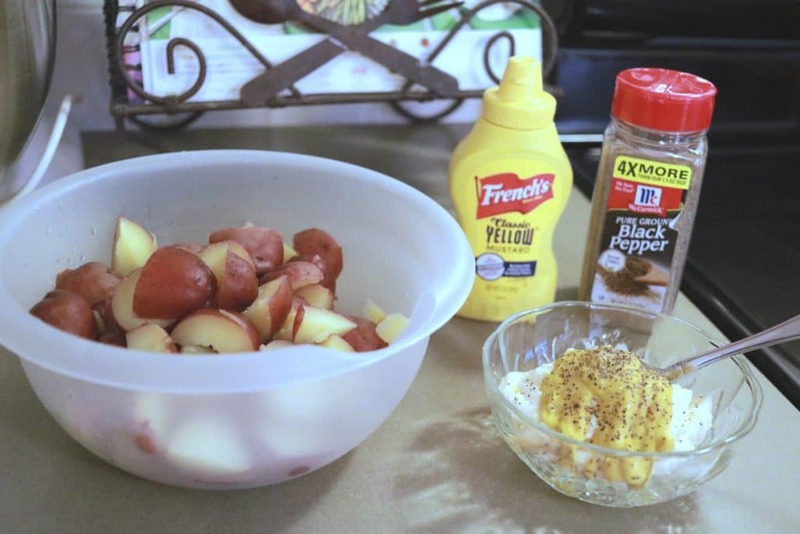 Once they went into the oven, I made the potato salad with our favorite French’s® Mustard. The actual making of the potato salad took only about 10 minutes and here is a little secret to make this go quicker. Boil the potatoes BEFORE cutting them. Then cutting them into pieces is a quick breeze that doesn’t hurt your hands. 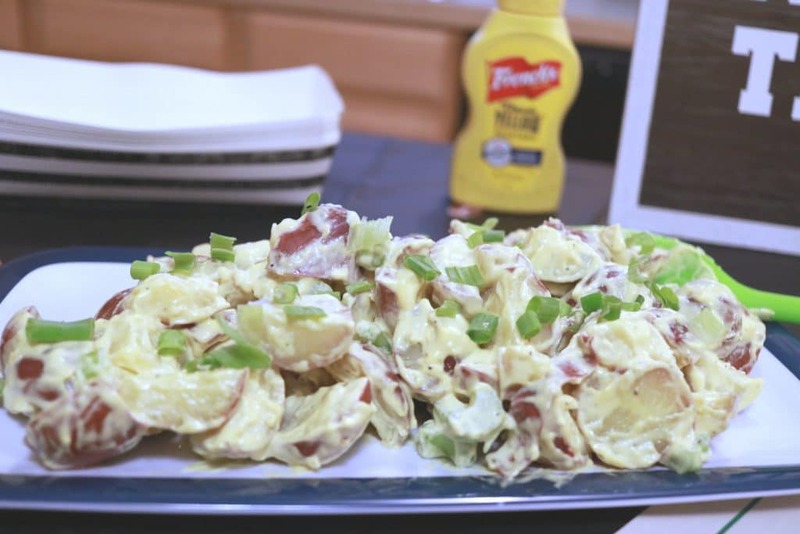 You can grab the recipe for this amazing Creamy & Tangy Potato Salad here. I also made chicken nachos featuring the Frank’s® RedHot sauce that were a huge hit and honestly not as spicy as you would think. The kids at the party devoured the nachos! I used this recipe for the chicken nachos if you want to check it out. With the food complete, all that was left was some very easy set up. I grabbed a black table cloth and some football themed napkins and food trays, along with a super cute sign, some scrapbooking paper and little football confetti. I covered our central island with the tablecloth, and then propped the “game time” sign up in the center. From there, use the scrapbook paper (mine has the yard lines on it) and place that front and center. Then lay your amazing food out. 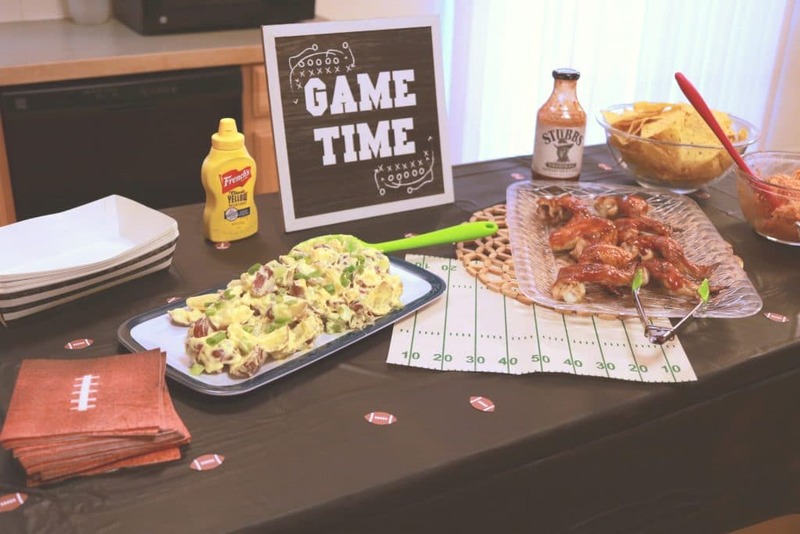 Sprinkle the confetti and add the trays and napkins and you have the easiest homegating set up that looks incredible too! It was a hit too! Everyone came in and grabbed a tray, filled it up with our delicious homegating food and sat for a nail biting game. People were raving about the rich flavors and went back for seconds and thirds! The kids ate a ton too. I have some new recipes in my book and am so glad that we were able to host a little get together with great food. There are literally tons of ways to use Frank’s® RedHot, French’s® Mustard, and Stubb’s® Bar-B-Q for delicious game recipes and you can use their easy recipe tabs on their websites to find more! Visit the UltimateHomeGate.com for a chance to WIN great prizes such as a big screen TV, brand new grill, and fantastic gift cards! This fantastic sweepstakes will help you put on an incredible homegate and the prizes include a big screen TV, Weber® grills and Fanatics® gift cards! What are you waiting for? Enter the sweepstakes and get the party started! Details on the awesome prize packs are below! 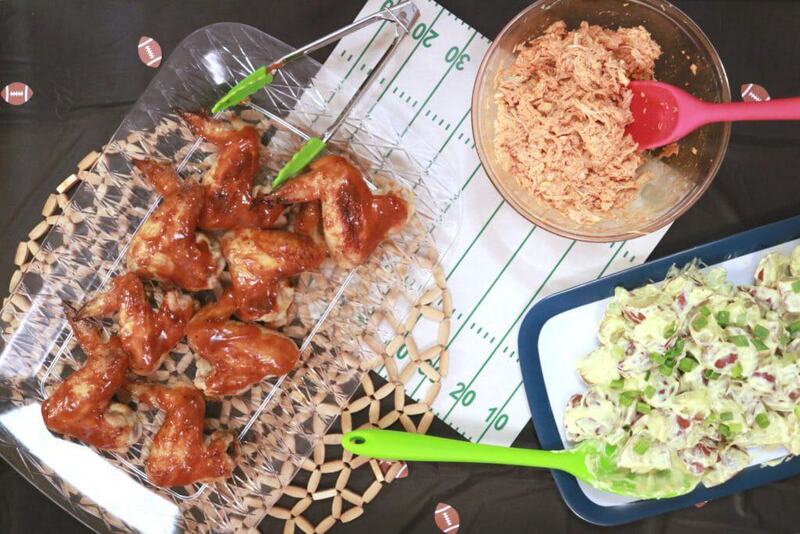 Are you ready to host the most amazing easy and delicious homegating party out there? Previous Post: « The $200 Master Bathroom Makeover YOU HAVE TO SEE!